By Bryan Camphire. Here we have another profoundly strange suite of music from Jute Gyte. Adam Kalmbach is the sole progenitor of this singular black metal project. Kalmbach has been sharpening his craft prodigiously for over a decade and Oviri is his most focused record to date. Here we have another profoundly strange suite of music from Jute Gyte. Adam Kalmbach is the sole progenitor of this singular black metal project. Kalmbach has been sharpening his craft prodigiously for over a decade and Oviri is his most focused record to date. The layers of guitars and percussion—woven together into interlocking harmonic and rhythmic superstructures—suggest an alien music of a future era. The song architecture is exorbitantly complex, which is nothing unusual for Kalmbach. Jute Gyte has always worked in microtonal scales that contain more than the usual seven tones to an octave. This amounts to an amalgam of frequencies coming together that sounds foreign to most ears, accustomed as we are to Western harmony. Yet Oviri marks a new milestone for this artist. In constructing the ghastly edifices on this album, it appears that a critical mass was achieved harmonically, which seems to require a cleaner sound. To answer to this, the distortion of the guitars has been dialed back considerably from previous releases. The dissonance of the microtonal harmonies—semi-tones clashing against each other in combinations heretofore unexplored in music: this is what creates menace. And this menace is as dizzying as it is fascinating to behold. Oviri is a record of tremendous and subtle feeling. The scampering guitars and electronics closing out "Yarinareth..." feel like malevolent vermin making a meal of your toes. The rubato at the beginning of "Fauna of Mirrors" feels like you're somersaulting down a steep hill out of control. The hard-panned accelerando flitting through "The Norms..." feel like so many uninvited guests stealing past your room as you try to rest. 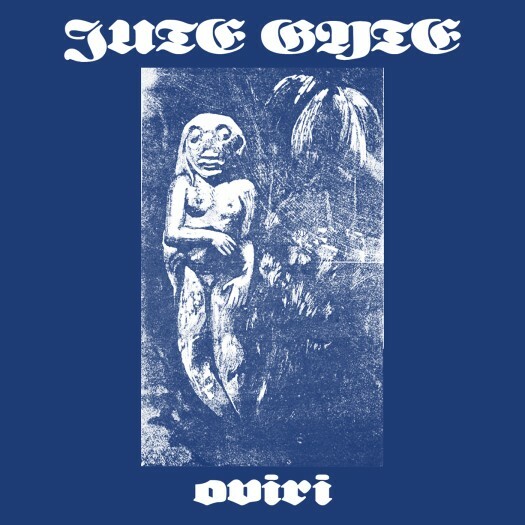 Oviri is something of a magnum opus for Jute Gyte. Of the eight full-lengths this artist has put out in the last five years, it is the longest. Six songs clock in at over an hour and fifteen minutes. Its titles alone reference Synthetist artist Paul Gauguin, fantasy-horror-science fiction author Lord Dunsany, and ancient pre-Socratic philosopher Democritus, "The Mocker," who is commonly depicted in art as incessantly laughing at human follies. The music on display in Oviri is no less extravagant in its scope than the worlds-within-worlds at which it hints. It may be tempting for some to dismiss this artist as grandiloquent. To do so, however, would be to fail to appreciate the sheer devotional nature of the music of Jute Gyte. There is nothing haphazard about any of this. It is hard to fathom the hours of labor and intense levels of concentration involved in fitting all the manifold aspects of this music together just so. Few releases this year will challenge you to contemplate the unknown quite like this one. Only brave souls need apply. Glad you like it Sir. Thanks for reading (and listening) and good luck with everything.